You must keep in mind the basic tricks to manage your bankroll. You want to have good bankroll management to make sure that your overall performance on the table over the years will be good. You do not want to bankrupt too fast, do you? You must keep in mind the following fact. It is estimated that people may enter a victorious streak and then they could enter a losing streak. There is no way for you to maximize your winnings, when you are in the winning streak and there is no way to minimize your losses. Knowing and accepting these facts, will improve your general performance after a long-run. 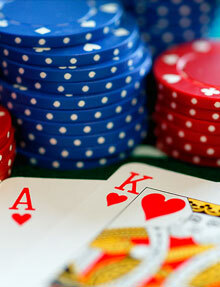 You must be able to adjust your bankroll to the swings, which you will experience for sure, when you play blackjack. Winning streaks are good because they will increase your money in the bankroll. However, the bad situation is when you are in a losing streak. You need to make sure that your bankroll will be able to resist these bad days. The only way to secure that is with good management of your bankroll. There are some pretty important factors, which will predetermine the management of your bankroll. That's why you need to keep them in mind, while you play blackjack. First of all, you need to do the math properly. Estimate how much money you are willing to spend for a minimum bet, estimate how often do you plan to visit the casino and finally estimate how many times do you plan to play your minimum bet per visit. It is recommended to start with a minimum bet of $5. This way when you plan to play 20 times your minimum bet, you will need 20X5= $100 each day that you are going to visit the casino. To withstand the major losing streaks, it is recommended to have 10 times bigger bankroll then the money that you are planning to use each day in the casino. This means that your bankroll has to be $1.000. When you start losing and you should know that this will happen to you, you need to leave the casino, when you are out of money. Spending more money will impact on your bankroll further.